Shocking news reported this week was the story of a five year old boy from Kentucky (naturally) who accidentally shot dead his two year old sister. First thoughts were that his parents must have been thoroughly irresponsible to leave their loaded gun in a place that was accessible to children. At that age kids will inevitably be curious about things. But then it transpired that the gun that was used was actually the child’s own weapon, given to him as a present when he was four years old. Someone had actually thought it to be a good idea to give a pre-school child a .22 calibre gun. Putting aside the debate on the right to bear arms, what rational adult thinks it’s appropriate to arm children? And then fail to supervise where and when this firearm is being used? This all makes the debates in the UK around exposing children to violence seem rather quaint. Crickett’s Kid’s Corner section of their website is a window into the minds of their customers. There are photographs of children posing with weapons. In fact, there are pictures of babies posing with guns. I say ‘posing’, but they are probably using most of their energy and concentration just trying to sit upright, what with the weaponry resting on their laps. Crickett’s testimonial page is also alarming. I quote: ‘My 4 1/2 year old daughter thought the “pink one” was far superior to a black synthetic stock, who am i to argue? 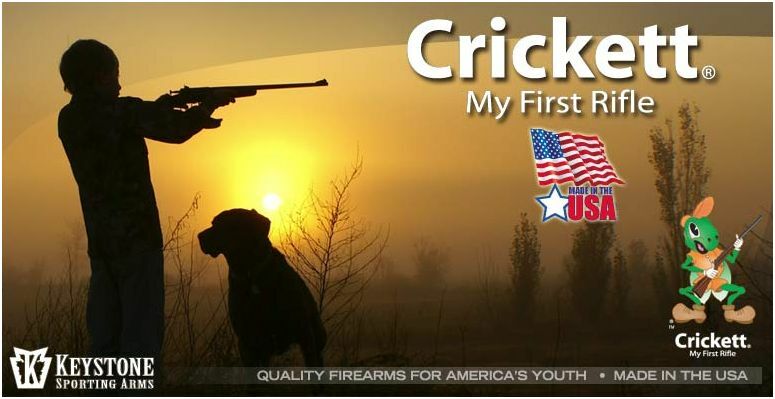 I never would have thought that a pink rifle would be sitting in the rack in the gun room.’ I don’t know what is more worrying, that this person has so many guns that he needs a whole room to house them, or that Crickett sells pink guns. Why not put fluffy lining around it as well, just to make it feel nice and snugly? These are lethal weapons, not My Little Ponies! Call me old fashioned if you will, but I can’t think of any reason for a child under 18 to own a gun. Surely, any kids who do express an interest in firearms should engage in this pursuit at a gun club under adult supervision? That way they’ll realise the necessity to fire guns in a controlled and serious environment. And marketing guns directly to children by making them appear more accessible only dilutes the message that these are potential killers in the wrong hands. Who can argue that kids’ accessibility to guns should not be tightly regulated? ©  Please click these links to share! I don’t know whether to be shocked or just not surprised at all that something like this would happen in the USA. Just .. lost for words to describe how I feel about someone giving their 4 year old a gun as a present. Nothing surprises me anymore when it comes to America’s love for guns. That poor child will be traumatised once he realises what he had done. This may not sink in for some time, but when it does, I expect he’ll go off the deep end and the family will implode. In spite of this, I don’t suppose the parents will change their attitude towards guns – much. Looking at it from the shores of Blighty, it would appear that for some Americans, the right to bear arms, from In Utero to morgue, is more important than a child’s safety. Enter your email address to subscribe to new post alerts. You knoow you want to. News Just In… Hell Is Real! Did The Demon Drink Pass My Lips? Someone Leaves His Card in the ATM. What Would You Do? Hello. Is There Anybody Out There? A Pint of Piss Water Please! Does Siri Know the Meaning of Life?